Come join us for the Spring 2015 HeyRunning Camp 2 from May 10th to June 28th and continue making progress through the warm weather racing season!! FILL OUT THE REGISTRATION FORM AND LOOK OUT FOR EMAIL CONFIRMATION! 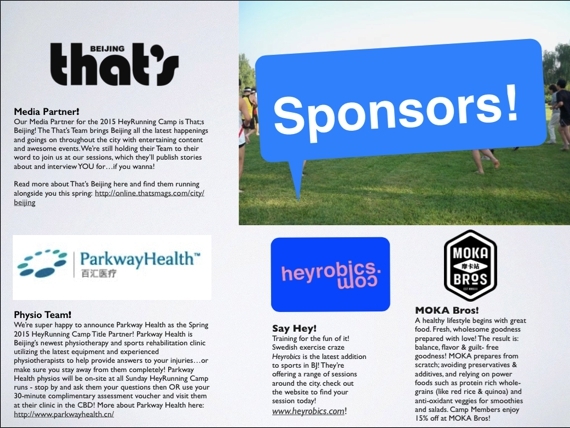 What is a HeyRunning Camp? 8 weeks of running training (minimum 4 sessions per week) for runners of ALL skill levels and abilities. It doesn’t matter if you’re just getting back into shape and targeting your first 5KM or trying to break 2hrs 30mins for the marathon! Sessions can be scaled up or down depending on your daily shape and ambition level – everybody is welcome and nobody gets left behind! HeyRunning Camp training programs and session themes are based on the HeyRunning 4S Method (Speed, Stride, Stamina & Strength), a simple, fun and effective training approach that has been tried and tested on thousands of runners. Where can I read more about the Camp? 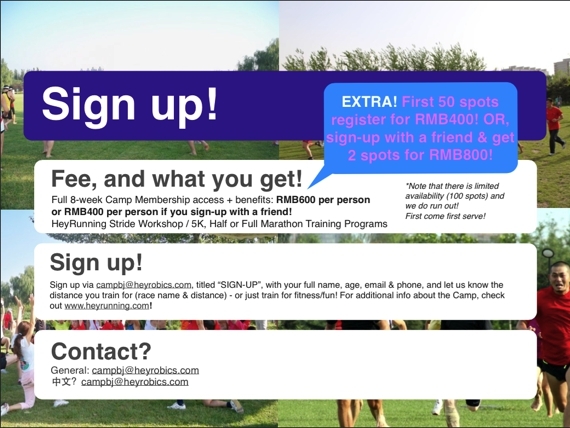 You can get more info from the HeyRunning Camp brochure below (download the full version HERE)! 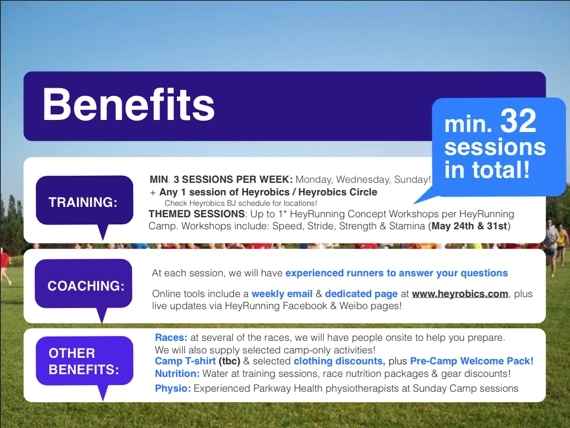 If you still have more questions then check out our HeyRunning Camp FAQs page HERE! And, if you still have more questions then send an email to campbj@heyrobics.com and we’ll get straight back! I want to try a HeyRunning session, how can I do so? Come along to any of our weekday sessions so that you can meet the HeyRunning Coaches while learning more about our training philosophy and the Camp schedule! 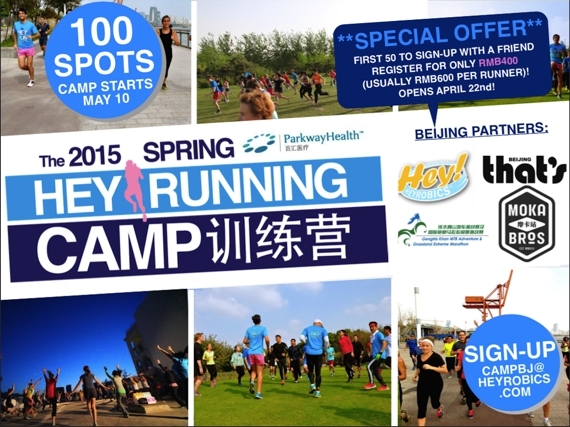 Keep up to date via heyrunning.com plus our Weibo and Facebook pages for more info! I want to join! How do I register? Hope to see YOU out running with us soon! Hey! These are some of our favorite quotes from previous HeyRunning Campers! For more of these just get in touch and we’ll send over! The HeyRunning Team is made up of some of the most experienced runners in Beijing and China with several years of training, coaching and racing experience. 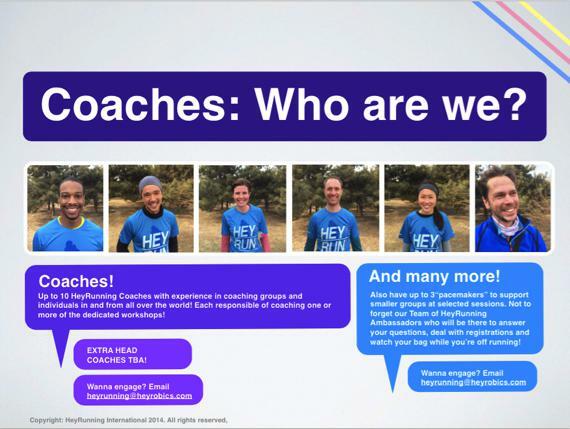 Stop by a HeyRunning session for a high-five and to get to know us! Hey! 8 weeks of training incl. minimum 3 HeyRunning sessions plus 1 Heyrobics session per week! Additional workshops and pop-up events will also be added! Sign-up how-to’s! It’s quick and simple! Complete the online registration form and you’ll hear straight back from us with the next steps! Hey! Check out our Spring 2015 Partners! They’ll be popping along to Camp sessions to tell you more about who they are and what they do! Short intro to each below!